Sambar is one of the most loved dishes in South Indian cuisine. It accompanies almost every meal. 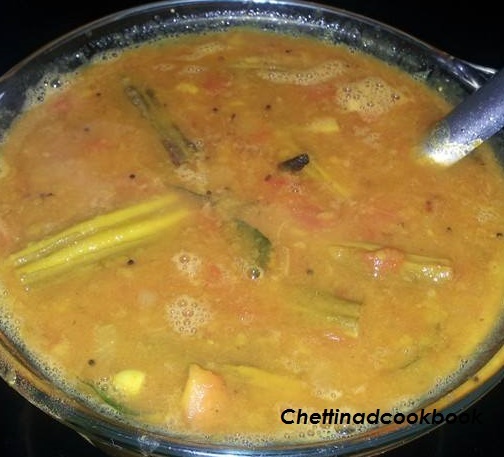 In South India, there are variations in the way of preparing sambar recipe, Any vegetable can be made into sambar with the following drumstick sambar method. Drumstick has a unique flavour and aromatic to enhance the taste of sambar. Boil toor dal soft and smooth with Turmeric powder(2 whistles in a pressure cooker). Add Tamarind paste Asafoetida, Salt and Sambar powder allow it to boil for 5 minutes. Heat pan with 2 tsp of oil season with above-mentioned ingredients “For seasoning”. Add curry leaves and remaining chopped onion and Tomato (this enhances the smell of sambar ) saute for 3 more minutes. Now add this to boiling sambar. Switch off stove transfer to serving dish sprinkle some Coriander leaves aaaahh….. wonderful smell I can feel it now.